Here's your anodyne to the sameness of the annual "Jingle Bells" playlist! Join the Cyberpluckers and their friends in their cozy song circle as they share their favorite uncommon and original seasonal song arrangements plus a few familiar ones. Jan Brodie, Beastie Dovey, Tony Archibald, Michael Garrett, Brian Kerwin, Sandy Gorst, Pauline Johns, Mairead Kerwin, Claire Crellin, Mary Quine, Rachael Storey, Shiela Quaggin and Leila Kneale. All Autoharp and Vocals. 17. Do You Hear What I Hear? Doug Pratt, Autoharp, Dobro, Lead Vocals; Julie Blackwell, Harmony Vocals; Gene Roberson, Rhythm Guitar; Manny Krevat, Bass. Holly Towne, Autoharp, Vocals; Niels Jonker, Bass. John H Orchard, Autoharp, Vocals; Mick Smith, Bass. 28. Mary Did You Know? In 1992, a band of technologically competent autoharp enthusiasts established an internet-based discussion group that they whimsically dubbed "The Cyberpluckers." As the internet became more universally accessible, the group thrived, drawing autoharpers from ages 18 to 90 and around the world, sparking discussion on everything from finger picks and technique to festivals and performance anxiety. No matter what else has been on the table for discussion over the years, the question "What are you playing these days?" has always been interesting and relevant. And every November those who are out performing in their communities report on their favorite songs and tunes for the holiday season, often inspiring another member of the community to learn a new song or to recall an old favorite. In 2009, we were inspired to pull together a 47 track compilation of Christmas music, each track uniquely different, and each imbued with the energy that on an ordinary CD might have been dispersed across the entire set. Proceeds from that project raised nearly $5000 that has been donated to the Mountain Laurel Autoharp Gathering, the California Autoharp Gathering, the Cranberry Dulcimer and Autoharp Gathering, the Willamette Valley Autoharp Gathering, the autoharp program at the Sore Fingers Summer School, and the gracious long-time host of the Cyberpluckers discussion group, Lindsay Haisley. That first project was so much fun that when the CD's started to run low, we decided to do a second project along the same lines. That's the set you can buy right here on CDBaby, thirty-eight brand-new tracks of music new and old, and with each track including at least one autoharp. Hopefully you will enjoy listening to it as much as we enjoyed creating it. It was so much fun performing for this CD! The AZ Autoharp club is featured , along with the composer, Lon Austin, on track #35, "Christmas Down in Old Sonora". Lon Austin is a Folk Music Icon in Arizona. Andy Hurlbut composed "A Story Often Told", track #4 and Barbara (autoharp), Kristie (mountain dulcimer) and I (autoharp) performed it with her. The CD is awesome and the musicians come from around the world performing Holiday Songs, many I have not heard before. Its great when our autoharp community comes together to put together such a fun project! This CD contains a delightful collection of Christmas carols and holiday music performed by people from many countries and backgrounds. It is definitely not your run-of-the-mill selections, but a truly heartfelt, quaint, and charming take on Christmas played on or backed up by a uniquely American instrument, the autoharp. Just a fun group of songs to brighten your Christmas season. Festive music with a difference. 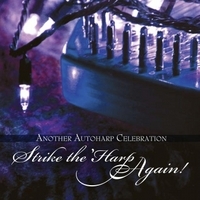 Strike the 'harp Again is like nothing you have ever heard before. With each track centering around or containing the music of an unlikely instrument, the autoharp, you are sure in for a treat. Many tracks, you will not have heard before but, of the ones you have heard of, you are unlikely to have heard renditions like the ones on this CD. A wonderful gift for a friend or oneself, this is a CD you can't miss this Christmas.